In winter, winds blow by pulses through a mountain pass across the Tehuantepec Isthmus (Mexico) to fan out over the Mexican Pacific in the center of the Gulf of Tehuantepec, generating large mesoscale eddies. In situ observations reveal strong cooling of the ocean below the axis of the wind, accompanied by the development of an offshore current jet that quickly evolves into a large anticyclonic eddy. Altimetry measurements, confirmed by drifter observations, show that these eddies propagate offshore at about 9 km per day, initially southwestward and later more westward. 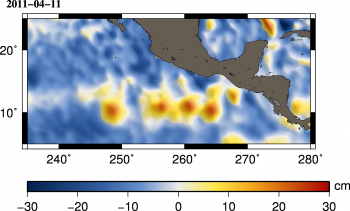 Their sea-level signature can be tracked as far as 140ºW before it disappears during the summer (the eddy season begins in late October and lasts approximately 250 days until early July), coinciding with the strengthening of the North Equatorial Countercurrent. More than twelve years of altimetry data show that five to six eddies are generated on average off the Gulfs of Tehuantepec, Mexico and Papagayo (Nicaragua) each year, and form a band of mesoscale activity between 10 and 12°N extending from 120°W to the coast. 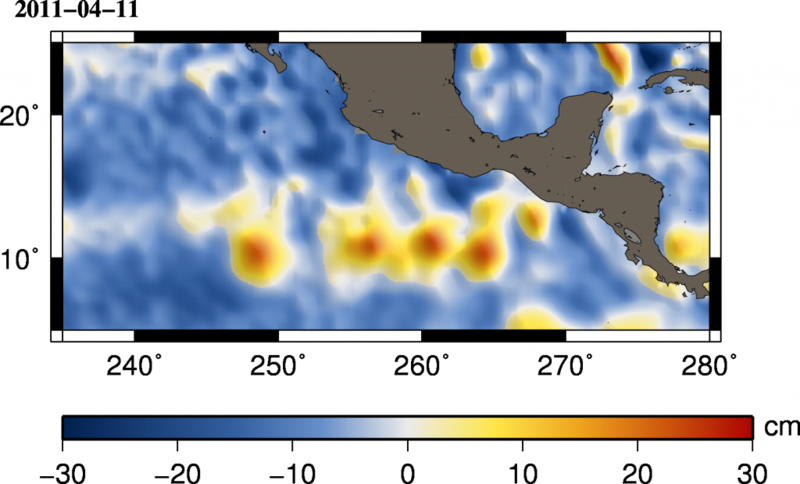 Such ocean features have a large-scale impact on the Eastern Pacific.